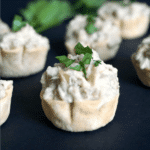 Mayo eggplant dip canapés, a fantastic appetizer for your New Year’s Eve Party or any other occasion. Finger food at its best! Although in Romania it’s called eggplant/aubergine salad, I have always thought that the name salad can be somehow misleading in this case. At least, that’s not what I would call a salad, and that’s not what comes to my mind when I think of a salad. So, I think it is safe to say that dip tells more about this recipe. Totally addictive, there is no wonder why Romanians absolutely love it. Even if some might think it is a summery recipe, given that the eggplant/aubergines are in season in late Summer/early Autumn, it’s one of those recipe that knows no season. Gone are the days when aubergines could only be found during their season, you can easily find them now throughout the year. Not at tasty though, but still. 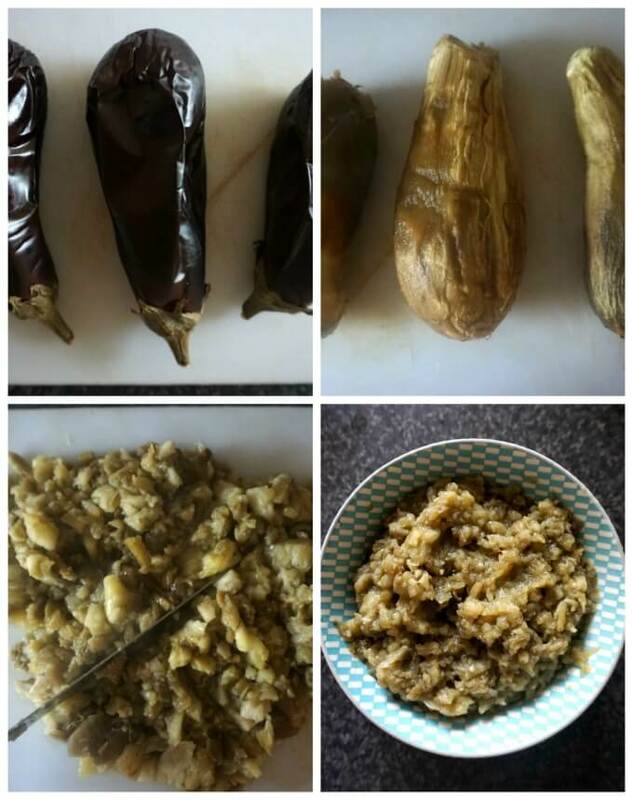 Mum usually roasts quite a huge batch of auberinges and freezes them for the winter, in this way she always has some when the family crave some yummy eggplant dip. You can choose to serve it as a dip with some baguette, crackers, breadsticks or some toast, or you can buy/bake some fancy pastry cases, and there you have, an appetizer for all tastes. There is hardly any effort needed here, once you get them in the oven to roast, there is little you can do, unless you choose to make your own mayonnaise. I chose the easy way, and bought some good-quality mayo to save some time, but the homemade one is not difficult to make either. Mum never ever buys mayonnaise, she will always make her own, but I’m rather paranoid nowadays about using raw eggs in any recipe, given that I have little ones. The difference would be that, while mum uses fresh eggs from their farm chickens, so 100% natural, I have to buy from the supermarket. And, let’s face it, the box might say free range eggs, but God knows what’s in the box actually. So better stay clear from raw/partially cooked eggs. I did not take any chance while I was pregnant, and I still don’t nowadays. Better safe than sorry I would say. If you don’t want to use mayonnaise, you can only add lemon juice, salt, and finely chopped onion. It is super refreshing, and super healthy. I don’t really stomach raw onions, so I did not add any. 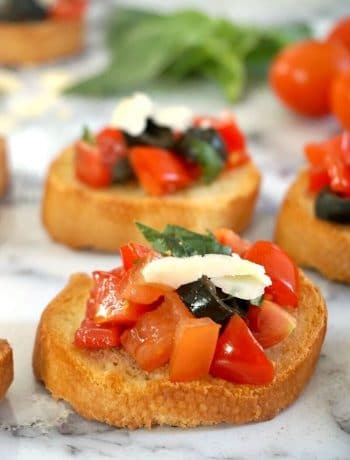 These bite-size appetizers make a great choice if you are after some tasty finger food for any party, be it the New Year’s Eve, Christmas, Easter, birthdays, and so on. No mess whatsoever, and the guests will be more than impressed. We recently had a party for my little one and I made these eggplant canapes. We have this lovely tradition on a child’s first birthday to arrange different things on a tray and let the child choose up to three things. It is said that whatever he/she chooses can tell what kind of person he/she will be. Her older sister chose a book, a hair brush (too) and make-up. Not a surprise she did not choose the fruit, she can be a nightmare when it comes to food, so who knows, the tradition might actually not be far from the truth. 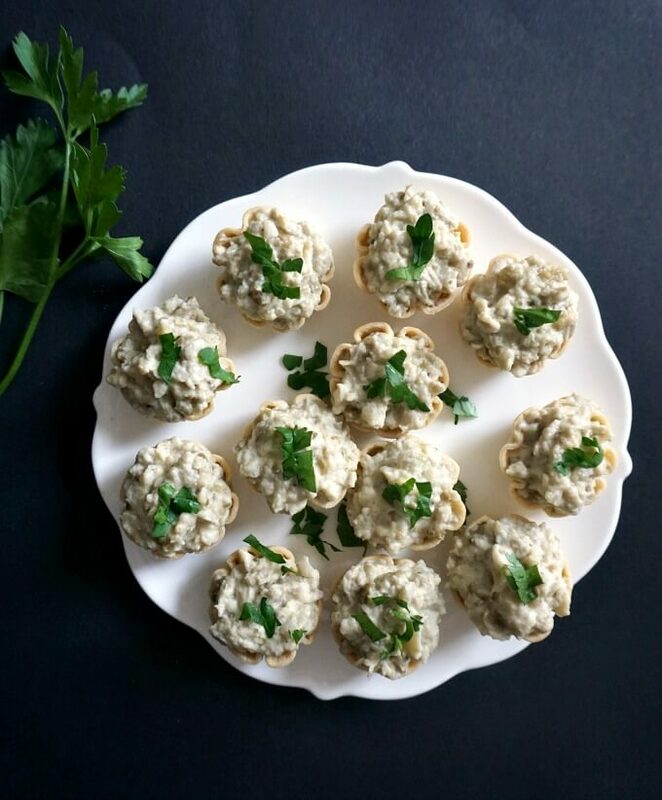 I absolutely recommend these mayo eggplant dip canapés, the Romanian way. 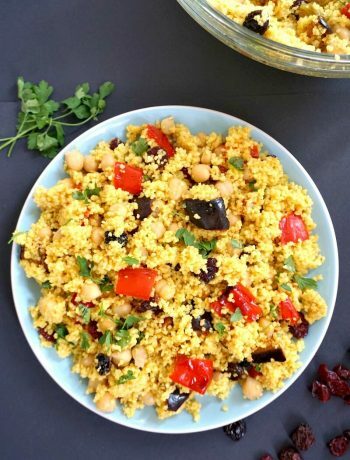 The dip is similar to the Greek eggplant salad, but not so much to the Lebanese Baba Ghanoush. Anyhow, give them a go, they are fantastic! 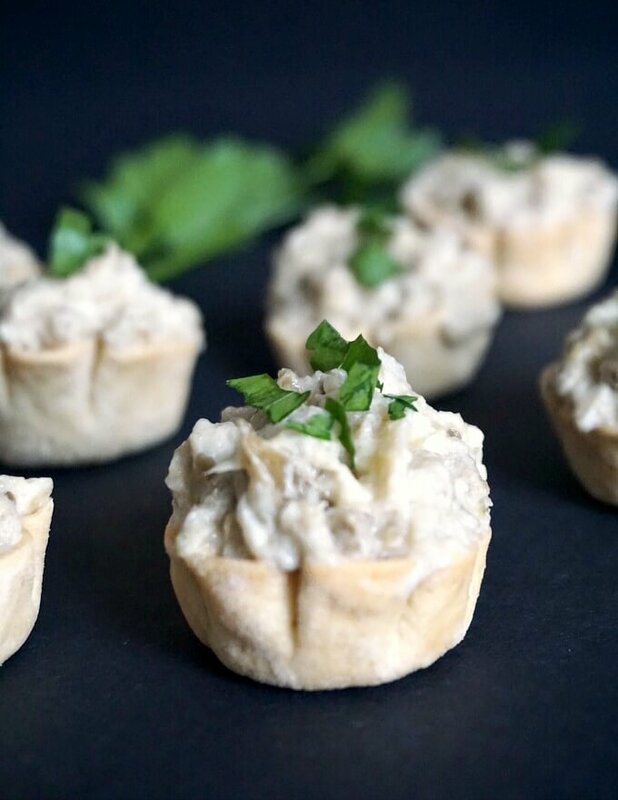 If you’ve liked my MAYO EGGPLANT DIP CANAPES or any other recipe on the blog then don’t forget to rate the recipe and let me know how you got on in the comments below, I love hearing from you! You can also FOLLOW ME on FACEBOOK, and PINTEREST to see more delicious food and what I’m getting up to. 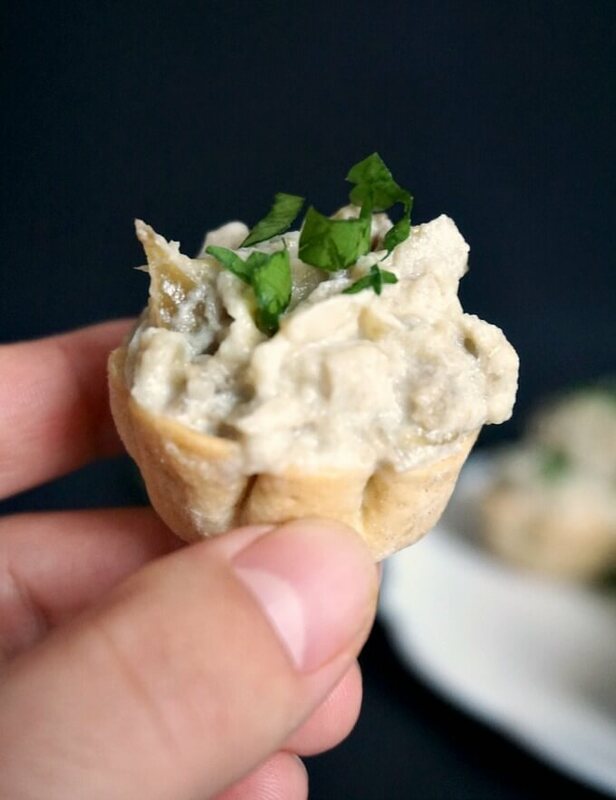 Mayo eggplant dip canapés, a fantastic appetizer for your New Year's Eve Party or any other occasion. Finger food at its best! Preheat the oven to 220 degrees C (438 Fahrenheit). Leave them to cool completely, then remove the skin and chop the flesh on a chopping board until you get a smooth paste. Some eggplant have a high water content, so make sure you drain the water before transferring them to a bowl. It works well if you put them in a colander. 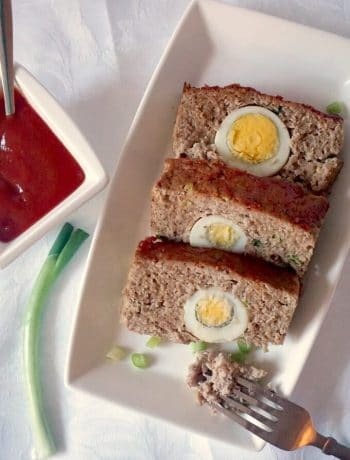 Add the lemon juice and mayonnaise and mix well. Divide between 36 mini pastry cases and garnish with chopped parsley.